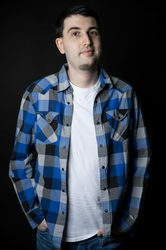 Michael "1KidsEntertainment" Hecht is a founding member of the group Elite3 (creators of "Pokémon 'Bridged", "Dark Swamp", "Controller Rollers", animations, and other works). He is editor/co-writer of "Pokémon 'Bridged" and provides the voices of Ash, Pikachu, James, Meowth, and more. Mike also works as an editor for TeamFourStar's gaming channel, Yu-Gi-Oh! Abridged, and JacksFilms. Mike has lent his voice to various works of TeamFourStar, LittleKuriboh, Kirbopher, and more, including "Dragon Ball Z Abridged", "Naruto Spoof", and "TOME". In his spare time, Mike enjoys yelling into the void, traversing New York City, and making Nowacking write his bio for him. Dummy.